The GPL discussion is all the rave in the WP community these days. In fact, it has been for a good while and many of largest premium theme providers for WP has already GPL’d their themes – with one notable exception; Chris Pearson, the creator of Thesis, a very popular premium theme. Matt Mullenweg (of WordPress) has criticized this very openly, and it’s now speculated that the only way to solve this is in court. Anyway, to make my point here ExpressionEngine is as we know a commercial product. Which means that you can create commercial addons, commercial themes, commercial whatever – without worrying about being infected by the GPL virus. So someone is selling all their themes as a bundle for $10. And they’re doing it all legally! Because it’s GPL. It’s a scumbag move, sure – but it’s legal. (Sidenote; WooThemes continues to be a very profitable business because of excellent support which is basically what they’re selling – and because most people want to do the right thing I guess, which is buying the themes directly from them of course). This is not something you have to worry about as an ExpressionEngine developer. Note; you still have to think about licensing though, as the whole “Brandon-Kelly-Did-I-Really-Creative-Commons-That?”-EEMatrix controversy demonstrated. Being a commercial product ExpressionEngine has an affiliate program. You get the money deposited to your PayPal account each month with personal thanks and gratitude from the ExpressionEngine team. This point is not to be underestimated. An affiliate program means you can blog and talk about ExpressionEngine and make money from something you would normally do being a part of the community. Are there a lot of affiliate programs for WordPress? Sure, popular addons like Gravity Forms, most premium theme providers like WooThemes and Thesis have their affiliate programs but that’s not the same – the EE affiliate program is for the CMS itself; everyone working with ExpressionEngine needs to buy a license. EE is the choice of professional designers etc. delivering websites to clients. I don’t know about you, but if an addon or theme can save me one hour, it’s definitively worth $60. People using EE are comfortable with paying for services that save them money or time. As mentioned in the previous point EllisLab dropped the free EE Core version since no one was using it anyway. Most were paying customers. Some communities consist of people who expect everything to be free. The EE community doesn’t. And that’s good for a third party dev! Devot:ee the ultimate addon directory for EE recently opened an addon store enabling developers to sell addons directly on their site. Yeah, just like the AppStore! This means you can create commercial addons, have them listed on the “official” EE addon store and make money without worrying about setting up a webshop etc. The WordPress community is huge. I don’t know but there are probably hundreds of relatively known WP developers. The EE community – not so big. About 10 – 20 relatively known developers. 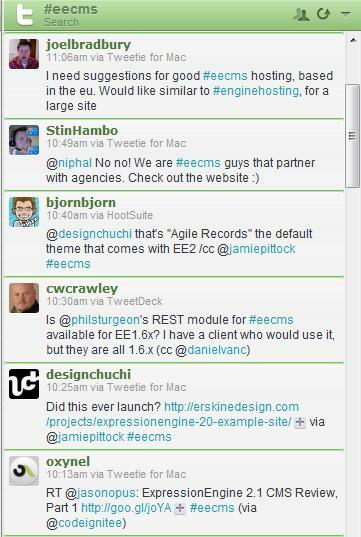 If you create 3 addons you’ll be invited to speak at EECI2011, hehe. In six months you can make a dent in the WP community or you can be a f*cking EE rockstar. Your choice. With 2.0 EllisLab made a great choice of going CodeIgniter all the way. This means that your EE addon is a CodeIgniter module, with helpers, libraries, views etc. EE comes bundles with CodeIgniter, and you can harness the power of the CodeIgniter framework in your EE modules. Nice! In addition to the CodeIgniter user guide (which is pretty good) there are developer docs for EE and the newly created Development and Programming forum to encourage discussion among developers. Yup, it’s easy to get started, so give it a go! Take a look at the Community page on expressionengine.com. Sites like EEInsider, Devot:ee, Show EE, Director-ee etc. are all sites created by third-party devs and taken to heart by EllisLab (creators of EE). It doesn’t even have to be a unique or new idea, just a nice implementation. Also, it could be argued that some of the most popular commercial addons for EE (Structure, SolSpace’s Tag for instance) in reality is pretty basic functionality that should be added in a CMS (pages/tagging). I don’t know for sure, but I have a feeling EllisLab likes the fact that there’s a commercial sphere around EE and that they don’t want to step on too many third party toes by incorporating this functionality into EE (and therby destroying the market for these third party addons). Of course this is just speculation from my side, and it can be argued this is a bad thing – but for a third party dev this is a good thing^TM .. And yeah, Brandon Kelly’s FieldFrame is just the exception that proves the rule. If you create something nice you might be featured on ExpressionEngine.com – and if you make a living selling an addon the ellisphant in the room might just let you continue with that. Everyone doing WordPress knows: you update when there’s a new version out, or else you might be at risk. Belive it or not; it’s not like that with EE. You can actually chill and not worry about these kinds of things happening. There’s very seldom a security patch, and if there is one there’s not enough people using EE for the Viagra mafioso to bother anyway. Do you really need ten reasons? There was only 9, that should be enough for anyone. If I added another reason it’d probably be some standard one about EllisLab’s great support etc. So let me finish with this; if you’re interested in checking out EE buy a license (don’t bother with the free Zend encoded trial IMHO, buy it and you’ll get the source and be able to debug, see what’s happening under the hood, etc.) – say hello in the forums or in the comments below or to me on twitter, follow the #eecms hashtag – participate in the discussion on Twitter, and of course don’t forget to subscribe to my feed if you enjoyed this post. What do you think? Are there other benefits about the EE community? Was I a bit too generalizing somewhere? Is WordPress really a MUCH MUCH BETTER CMS AND EVERYONE ELSE MUST DIE? Let me know! Nice post, and I’m with you all the way on EE. I’m not so sure about the “no-one uses it anyway” comment about the free core version. If it wasn’t for the free version I’d have never given it long enough to get to grips with EE and base a large chunk of our business on it. I hope the decision doesn’t cut off new blood coming into the community. As a result of having the time to play around, my business and my clients have spent thousands in total on licenses and add-ons since we started using EE in early 2008. You talk about support for EE,but my number 10 would be support for the add ons. My memory of Joomla was endless buggy and insecure extensions which were always in beta. As a commercial agency working with commercial clients, I’d rather pay and know something works, than risk sing something I’d end up spending more time fixing than building from scratch. The providers of add ons to the EE community have been, without exception, excellent in this respect. You lost me as part of your audience right there. 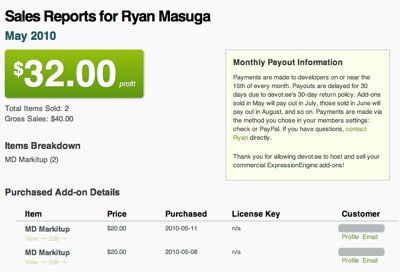 I’m not calling GPL bs, I’m saying you don’t have to worry about “GPL related bs” – that is, someone taking your product and giving it away for free or selling it cheaper (like the WP themes example). Bjorn, nice job man. My sentiments exactly. I came from the Joomla Community about the time the GPL dropped and all of the 3rd party devs went scrambling trying to figure out what they were going to do. I checked out EE and never looked back. I must say it took some balls for you to write this though. The WordPress mafia is certainly going to come break your knees now. Hey, i work with WordPress and i work CodeIgniter a lot. I like WP because its quite simple to use and develop for if you spend some hours digging in. The only (big) thing i really hate about WordPress is its documentation. The “Codex” (that the documentation) is partly bad written, some functions are not documented at all and so on. This is the thing with Ellislab and CodeIgniter, i LOVE the CI user guide which is the best IMO. I would love to check out EE but its quite expensive, 300 $ if i really want to use it for client work. For me it’s the community and support. And what Bjørn describes in point #6 is absolutely spot on. The couple of times when I approached EE about events or an idea that’ll serve the community as a whole, they were not only welcoming, but proactively supportive. In my past “agency” word, coming from using six- seven-figure CMS like Interwoven or Vignette, or even working with Drupal and Joomla (both fine platforms with great community), this is something that was new, and quite exciting. Regarding the price, I think almost in every case it more than washes out by having the support of EllisLab, the EE community at large, and save in development time. To be realistic, the end cost would surely be over to $400 with the commercial license and a few “must-have” add-ons (Matrix, Playa, NSM Better Meta, etc.) but so far most of our clients have accepted it as part of doing business, and even a plus by not being an annual or renewal license. Having said that, I think we’re in a pretty good period in time with so many terrific choices with WP, EE, Drupal, Joomla et al serving overlapping segments of the market. And what’s not to like about that. I have to agree that you lost me on the GPL bs. With that little outburst, the rest of your posts seems to be EE evangelizing. Get in on EE and you will get rich and popular, I promise. That to me seems like the real bs. I suppose you probably think Linux is bs too, right? Oh wait, that’s obvious from your praising of Apple’s app store. I certainly hope devot-ee doesn’t become like the Apple app store. I don’t want my app arbitrarily rejected or taken down from the devot-ee add-on store for no reason. For the second time; I did not call the GPL bs.